We look to each person or organization to disseminate the information and action alerts that the Sunshine Health Freedom Foundation distributes and to support the work that the Sunshine Health Freedom Foundation is doing to protect the health freedoms of ALL Americans. If 10 people alert 10 others and that cycle is repeated 6 times, one million people have been notified ! Sunshine Health Freedom Foundation is a volunteer organization. 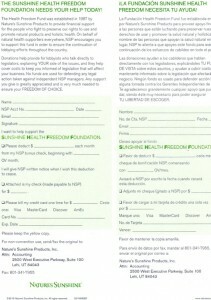 Make a donation to the Sunshine Health Freedom Foundation. Share your time, your talent, your connections and your funds to people who can help us, your network and your money to help us keep our health freedoms alive and well. Have a friend who does public relations? Your cousin knows a Congresswoman? You are an expert at clerical skills? We need all of that and much, much more. Have ideas that can increase our effectiveness? Want to arrange a lecture, rally, symposium, fund raiser or a concert? It’s your organization. Let’s build it. Help out by volunteering to be the Coordinator for your state. If you are interested in helping in this capacity, please contact Sunshine Health Freedom Foundation. If you don’t want to be the State Coordinator, or if that position has already been filled for your state, consider being a Path Finder! A Path Finder is a person who helps the State Coordinator with Health Freedom in their state. If more people were involved, more would get accomplished! Also, the more involved means that only a few don’t have to do all the work! Even if you can only do an hour a week… that is an hour a week that would be greatly appreciated!!!! Data entry, phone calls, faxes, emails, fund raising, research, and much more! If you are interested in being a Path Finder, please contact your State Coordinator or Sunshine Health Freedom Foundation. It is important that you build relationships with your personal legislators. When you have a relationship with your personal legislators, it helps when you contact them to ask them to vote for a health freedom bill, or to help defeat a bad bill. 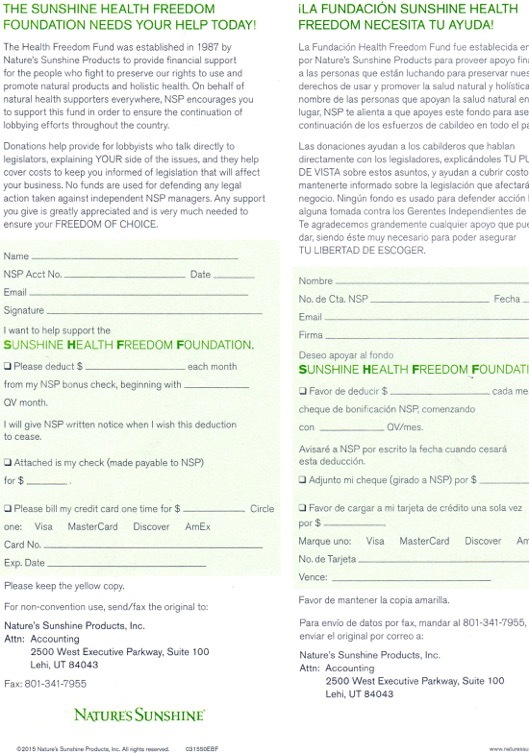 Become a Sunshine Health Freedom Foundation SUPPORTER ! Every dollar counts. If every person who takes Vitamins and/or Supplements sent only $1, the foundation would have $175 million dollars to fight for our Medical Freedom. This is a battle the American people want and have to win. Please support the foundation so everyone can win this war! We urge you to give generously to help us make your voice heard so clearly that no one will be able to take away your health freedoms. Not now, not ever! But your support is urgently needed. 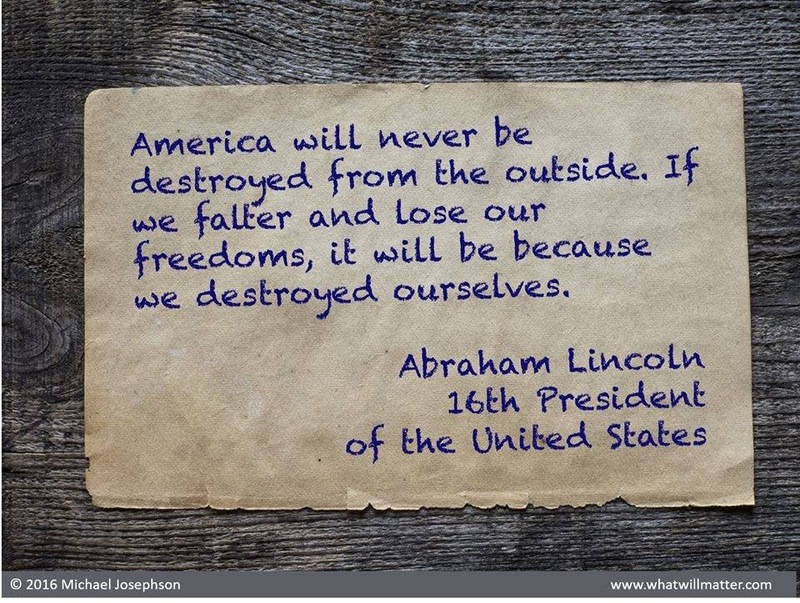 You have an exceptional opportunity to be part of health freedom history! Join The Sunshine Health Freedom Foundation in creating a network which will impact the world-wide struggle for health freedom! Help us illuminate the path to health freedom! Click the form for a printable version.